Part of prepping and being self sustainable is learning to have a garden to grow foods for your family. One of the most important things you need to remember is that most seeds in the big box stores you purchase are hybrids or genetically modified (GM). You want to know why to use heirloom and non-GM seed I am betting. Some of the major seed companies want to control the seed market and force people to use them for their vegetable garden seeds. If this happens they then control the first stage of food production. If they chose not to provide seeds, then you will have to purchase THEIR foods from the markets. Hybrids and GMs are geared to modern agriculture’s mass production. They aim to produce higher yields and more uniform size and maturity times of fruits and plants. With this focus on breeding for specific characteristics, much has been lost in the flavor and nutrition department, with unhealthy side effects for us all as we have witnessed in our population over the past generation. With the proper ground preparation, heirloom seeds produce vibrant, wonderfully tasting fruits and vegetables. Now they may not look the pretty because they haven’t been bred for looks, but the flavor compensates. Plus you can save the seeds and use them to grow next year’s crop. In the past I have purchased my seeds from several places. 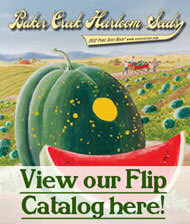 One company I use is Baker Creek Heirloom Seeds. They have wonderful customer service and the plants and vegetables have been wonderful. Another company I plan to use this year is St. Clare Heirloom Seeds. It is run by a Catholic homeschooling family. I want to support as many companies as I can which are providing us these seed options. St. Clare’s has seed packs for a variety of needs: a beginning gardener, a large family, an herb garden, a children’s garden and so on. Plus they have a large selection of books to help you get started. During the late fall and early winter is the time to check with you local extension office for when you can safely plant in your area and the usual growing season length. Decide what you would like to plant for the coming year. If this is your first time, maybe to a salad garden. Your would plant different types of lettuce, cucumbers, tomatoes and maybe onions and bell peppers. Zucchini is always a good one to plant, and very hearty with decent yields. Then look online and through the catalogs and see how much you would need to plant to feed your family. The wonderful thing about a salad garden is you can have multiple plantings of lettuce through the growing season so you can always have fresh. I love heading out to the garden and picking our salad for the night. Once you know how much you need to feed your family, then you need to plan your garden. You will need to figure out the best place to plant the garden in your yard. Based on what you are planting, you will need to figure out the size you need for your garden. Next you will need to decide are you going to do a Square Foot Garden, or a regular in the ground garden. Once that is done, you will need to plan it. There are several garden planning tools available on the Web or you can just take out some graph paper and go to town. One book I love to share is The Backyard Homestead. It shows you how to use the space you have to have a bountiful harvest. It is amazing what even a quarter acre can provide for your family. It even shows how you can use your space to have things like dairy goats, make cheese or raise meat rabbits. So check out The Backyard Homestead, as good starting point to learn about being self-sufficient. Once you have the basics there are so many other books where you can go for details and further knowledge. Now is the time to start thinking about a garden, so come on and join me as I plan mine.